The Lord is merciful, but that doesn’t mean we slack off, says Fr. Michael Rossmann, SJ in this week’s One-Minute Homily. Turn the other cheek? It’s reckless. And effective, says Fr. Michael Rossmann, SJ in this week’s One-Minute Homily. Not everyone does things the same way. Thank God! Fr. Michael Rossmann, S.J. gives this week’s One-Minute Homily from Panama, the site of World Youth Day with Pope Francis. Making time for silence is one of the most countercultural – and nourishing – things we can do, says Fr. Michael Rossmann, SJ in this week’s One-Minute Homily. At the beginning of this new (liturgical) year, we’re asked to stay awake and allow Christ to make this the best year of our lives. Use your head. But also your heart. Fr. Michael Rossmann, S.J. 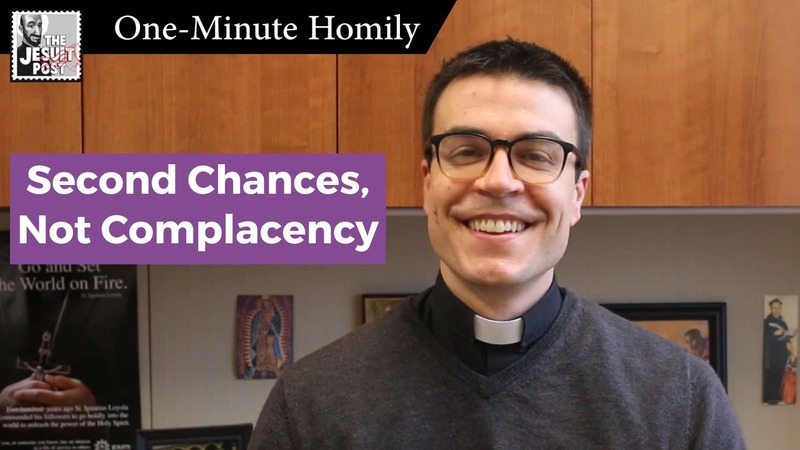 preaches in this week’s One-Minute Homily. Fear of missing out? We’ve all been there. But when we truly commit to one person or one vocation, we actually experience freedom, says Fr. Michael Rossmann, SJ in this week’s One-Minute Homily.